Arcade Fire are holed up in the studio working on the follow-up album to The Suburbs. The band have already confirmed that they plan to release a new record in 2013. In the past, the band rehearsed and wrote in an old Montreal church. After the roof fell in, they had to find a new space. Drummer Jeremy Gara told an Ottawa radio station that the band have congregated to develop new songs. "Now we're in the studio pretty much full-time just doing what we do," he said. "And we kind of shut the door. We haven't really gone out and done anything in over a year now. We haven't done photos or interviews or anything. We're just working on music and growing beards and living at home a lot and going out to dinner together." It’s a set-up reminiscent of another legendary Canadian group, The Band, who famously made much of their finest music while living in seclusion in a farmhouse called Big Pink. Similarly, Arcade Fire have been given complete artistic freedom. "We are under no pressure from record labels or management or whatever to do anything on any sort of schedule," Gara said. "We're just working. We have no deadlines. It's kind of coming along." One new track has already surfaced online. The song, called 'Crucified Again', was filmed at a low-key New York gig. 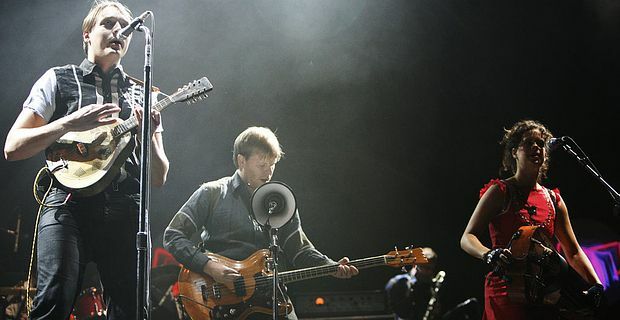 The provocative lyric suggests that writer and singer Win Butler might be revisiting some of the themes explored on the 2007 album, Neon Bible.